Today’s ‘Recipe of the Week’ is an Italian classic and it’s easy to make at home. Clear your kitchen worktops and make some fresh ravioli! 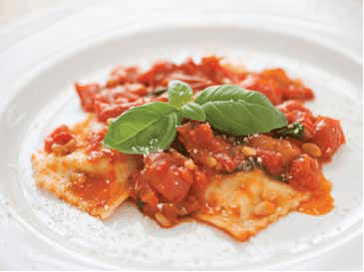 Serve the ravioli with a simple tomato sauce or pesto. Enjoy with a glass of Sicilian red wine. Buon Appetito! Make a well in the flour, place a small amount of oil, egg and tepid water in the centre then mix together. Knead dough well until it is glossy. Let it sit for one hour. Roll out the dough until flat and thin. Mix the filling ingredients together. Place a teaspoon of the filling on the pasta sheet. fold pasta sheet over the top and seal well, pushing out any air pockets. Cut the ravioli to shape. Cook in boiling water for 5-10 minutes to cook the ricotta.